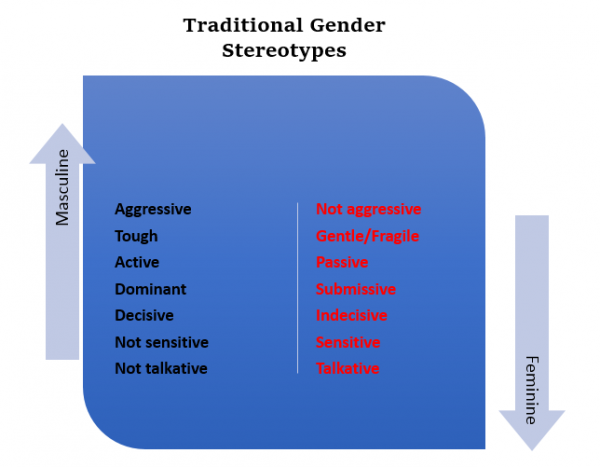 Gender stereotypes are deeply ingrained in our cultural norms and biases. They predict that our sons will become more aggressive, dominant, and independent, as well as less sensitive and non-nurturing. In stark contrast, gender norms say that our daughters will be more passive, submissive, dependent, sensitive, and nurturing. Stereotypes like these are based in part, on commonly seen traits, but social science gender studies have shown that most gender norms are socially constructed and have no biological basis. Many parents, myself included, see the confines of gender norms as limiting to development of the full range of human experiences and emotions. It can also discourage our children from discovering all their talents. As our children explore the world around them, the acceptance or critique of their parents is key to whether they will continue pursuing any activity. In big and small ways, gender neutral parenting practices can help us guide our children towards their full potential. Check yourself. Are you still clinging to many outmoded gender stereotypes? Assess your own ingrained gender stereotypes, and think about the way you talk to your children. I read once that parents tend to point out beauty to their daughters and are more likely to encourage sons to analyze and count. On a road trip with my then two-year-old son, I was shocked when I realized we were having him count the cacti instead of pointing out the pretty colors. Even those of us who feel stereotype-savvy can still fall prey to enforcing them. Reinforce behaviors that challenge typical gender roles. Whether it’s boys playing with a baby doll or girls showing interest in cars and balls, encourage play that shatters social norms. These encouragements become small building blocks that help our children explore the full range of their talents and foster positive human qualities like nurturing. After all, don’t we want all of our children to become good partners and parents someday? Use encounters with sexist gender biases as a teachable moment. For me, these come up often in toy aisles marked “Boys”. A simple, subtle statement like, “Well isn’t that silly, girls like RC cars too,” usually does the job. Foster mixed-gender friendships and plan playdates with an expansive range of activities. From sports to ballet to dress up, all kids can benefit from the freedom to explore the world through play. Pick gender-neutral room colors for kids. This allows you and your child to add the personalized colors and themes that appeal to them. It’s also easier to update as their interests inevitably change. Never limit activity or give privileges based on gender. If something isn’t safe enough for our daughters it shouldn’t be seen as safer for our sons. Also, instead of having rules like “we don’t hit girls” a focus on why we don’t hit in general may be more beneficial. To take it a step further, you could even provide a lesson about your morals surrounding someone stronger picking on others with less power. Show the full range of emotions in your household, and encourage others to as well. As parents, it can be easy to try to shelter our children from the sadder things in life, but both girls and boys need to learn to experience sadness and the natural reaction of crying to be healthy whole adults. As I’ve told my nephew and I’ll eventually tell my son, all boys and men feel like crying, but only the bravest ones can. Avoid gendered messages in clothing. I once saw a pink onesie that said “too pretty to do math” in a catalog next to a blue one that said “smart like daddy”. Many other messages like this can be seen, like “boys will be boys” versus “born to flirt”. 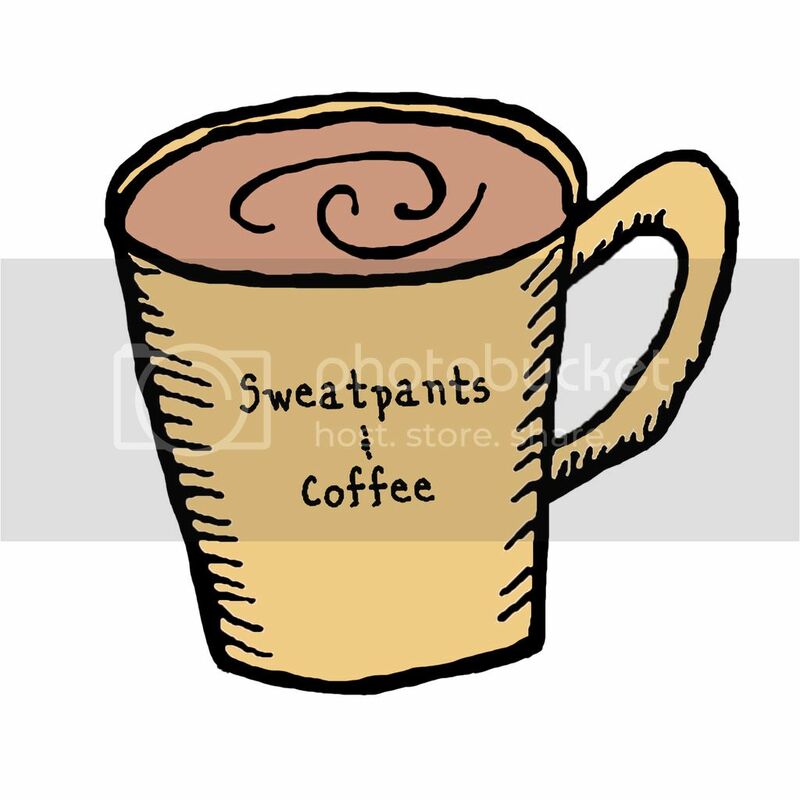 We may think it’s just a funny shirt, but these statements reflect and reinforce values. Question gender generalizations. When the opportunity arises, probe generalizations you see in pretend play or language. In our house, I like to point out the jobs like police officers or soldiers that women do too. I also highlight people we know as examples, like males who are nurses or teachers. Support gender inclusive companies and policies. 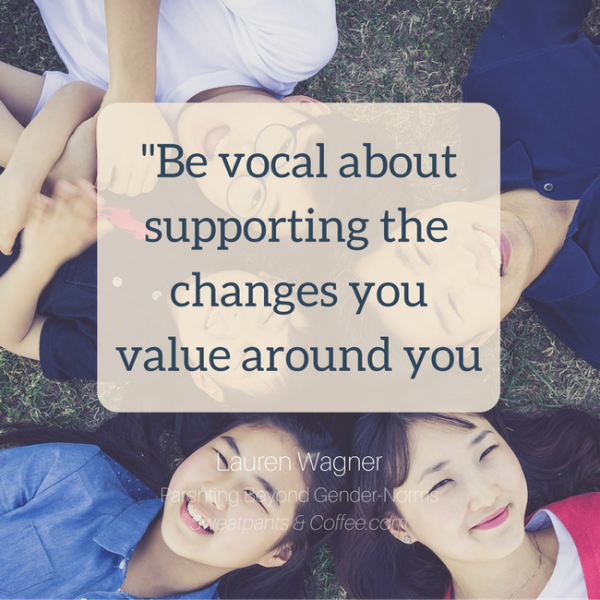 Whether it’s Target eliminating gendered toy sections or organizations supporting girls in the STEM fields, be vocal about supporting the changes you value around you. Remember, as always…little eyes are watching. 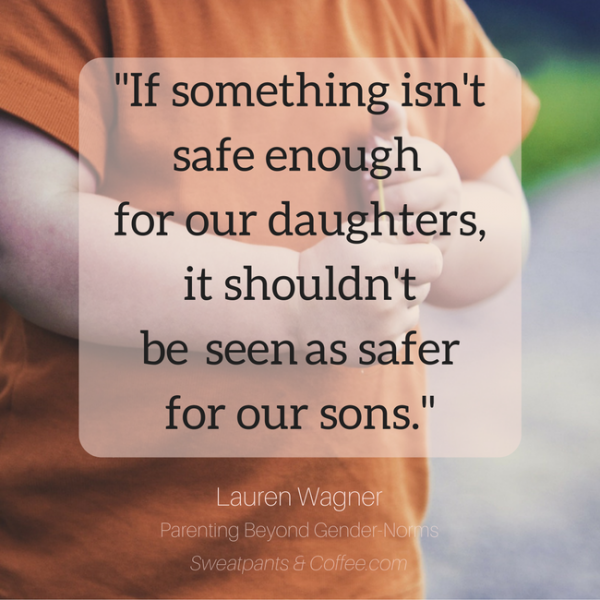 Lauren Wagner is a freelance writer and mom who founded Cadence-Pro LLC. and is based in Minneapolis. Born and raised in St. Louis Missouri, she had a 10-year career working in EMS before attending the University of Missouri St. Louis and pursuing her passion for writing. She has written for magazines, published poetry, instructs poetry workshops and recently started a blog called CadencePress.